Wind River betrays its own principles when it sidetracks into carnage. It would be easy to mistake Wind River's earnestness for nobility. It's the kind of movie that appears to have its heart in the right place, though it becomes clear by its third act that it doesn't possess the courage of its own convictions. On one hand, it's a tragic drama about the barbarism of men (particularly white men) and the impetuous displacement of Native Americans to unforgiving, nearly unlivable landscapes. On the other, it's a grimy little revenge thriller that essentially exploits what it condemns. The film is never able to successfully reconcile its conflicting tones, and its righteousness too often reads as disingenuous. Of course, one could argue (and a lot of critics are) that such disparities accurately reflect the brutal Wyoming setting of Wind River, which is so beautiful on the surface and yet can surely kill you. It's still getting buffeted with blizzards in the springtime, and it gets so cold at night that your lungs could fill with blood and then freeze from the inside out. That's what happens to a young Native American woman named Natalie (Kelsey Chow), who we see running barefoot through the snow from an unseen threat in the film's opening scene. 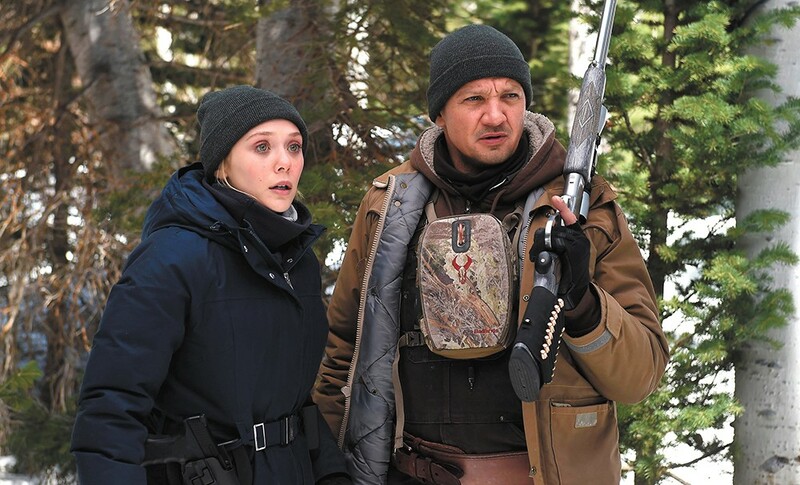 Her body, crystallized in the sub-zero temperatures, is found the next morning in the forests of the Wind River Reservation by Cody (Jeremy Renner), a game tracker hunting the mountain lion that's killing his former father-in-law's cattle. In a bizarre bit of dramatic parallelism that practically screams "screenwriting device," it turns out that Cory's late daughter was not only a good friend of Natalie's, but also died in an eerily similar way. Enter big-city FBI agent Jane Banner (Elizabeth Olsen), so ill-prepared for the frigid climate that she doesn't even bring a winter coat with her. Because the tribal police chief (Graham Greene) has so few deputies, Banner demands that Cody assist in her investigation, which comes to involve Natalie's drug dealer brother and her secret affair with a white oil-drilling worker. Wind River is the latest bit of rural noir from Taylor Sheridan, a sometime character actor who earned (deserved) acclaim for writing the genre deconstructions Sicario and Hell or High Water. This is the first of his screenplays that he's also directed, and as in those films, its locale, often as harsh as the people inhabiting it, is vividly depicted. Sheridan isn't as deft, however, at navigating his own choppy moral waters. His earlier scripts certainly paid lip service to sociopolitical themes — Sicario to the pointless violence of the drug war, Hell or High Water to the economic ruin of post-recession America — but those issues didn't get in the way of Sheridan's whirligig plots. Wind River wants to be both a gripping crime procedural and a sobering look at the plight of Native Americans, but it's not unpredictable enough to be the former and too facile to be the latter. It doesn't help, either, that its protagonist is a white guy; had Gil Birmingham, so effective as Natalie's grieving father, been our hero, the story might have been more meaningful. And while Sicario and Hell or High Water had their share of purple writing (Sheridan's style recalls both the terse, hard-boiled masculinity of David Mamet and the bleeding-heart, on-the-nose speechifying of Aaron Sorkin), Wind River is sometimes wildly overwritten, with dialogue that strains under the weight of its own self-importance. It contains numerous scenes in which Renner delivers long-winded monologues that needlessly underline points we didn't need explained, and it's as if Sheridan is emboldening text that he's already put in italics. Wind River is not showing in any theaters in the area.